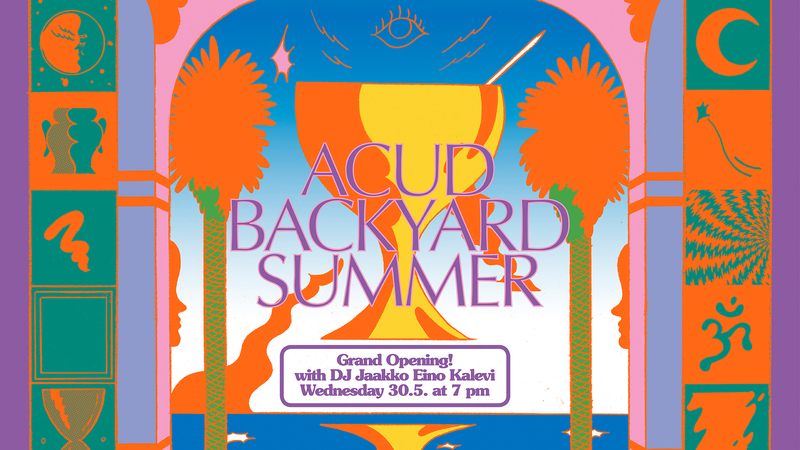 ACUD MACHT NEU cordially invites you to the grand opening of ACUD Backyard Summer 2018. Welcome the best season of the year on May 30th with the master of summery vibes, Mr. Jaakko Eino Kalevi. And enjoy hypnotic tropical cyborg music by WaqWaq Kingdom. Plus special summer drinks at our new summer bar! And sweet and salty delights by Dolly Soulfood. Combining synth-pop, folk, funk, and psych-rock into trippy experimental pop, multi-instrumentalist Jaakko Eino Kalevi grew up in Jyväskylä, a city in central Finland. He began making music as a boy after discovering Dream Theater’s prog-metal and hip-hop, teaching himself how to play guitar and use beat-making software before exploring reggae, disco, techno, and more. Kalevi issued a string of releases reflecting his omnivorous musical taste, including 2010’s coldwave-inspired album Modern Life and 2013’s hazy, fittingly named Dreamzone EP. The following year, he released the disco homage Yin Yang Theatre, an EP on DJ Tim Sweeney’s Beats in Space label. His 2015 self-titled album arrived via the Domino imprint Weird World. Formed in 2015, the science ninja team WaqWaq Kingdom is running secret operations from their underground bases in Berlin and Leipzig. With their combined WaqWaq powers they set out to save the galaxy and re-chart sonic territory as we know it. The marvelous Selina will delight our palates with her salty and sweet delicacies: dumplings, cookies, salads, cakes, all made with love and high quality ingredients!